An Audi R10 diesel (No. 8) won the Le Mans 24 Hours race on June 18th, the first diesel-powered car ever to do so, and with a four-lap lead over the second-place car. 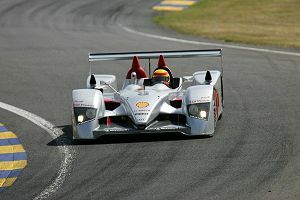 A second Audi R10 (No. 7) took third after having to replace a turbocharger earlier in the race, a delay that cost it 10 laps. The Le Mans 24 is an endurance race; the winner is the car that covers the most distance in 24 hours. Cars are driven by teams. The No. 8 covered 380 laps on a 13.65-km (8.48-mi) circuit in this year's race. The Audi R10 TDI is powered by a completely new all-aluminum, 5.5-liter, twelve-cylinder twin-turbo TDI engine that delivers more than 650 hp and more than 811 ft. lbs. of torque. The V12 TDI used in the R10 is the first Audi diesel engine with an aluminum crankcase. The cylinder-bank angle is 90 degrees. The V12 TDI has, like Audi production car engines, four valves per cylinder and twin overhead camshafts. The common rail fuel injection system pressure exceeds 23,000 psi. The V12 TDI is equipped with a pair of diesel particle filters. Peugeot has announced that it will enter the 2007 Le Mans 24 Hours race with a new diesel car - the Peugeot 908 - powered by a 5.5-liter V-12 HDi diesel engine equipped with a diesel particulate filter system. For those of you who have doubted that diesel powered automobiles and light trucks will ever make a dent in the US market, this is your wake-up call. Diesel powered cars make up over 58% of the new vehicle sales in Europe. They can achieve 30-40% better mileage than can equivalent gasoline engines. As fuel prices continue to rise, these engines will become much more popular in the US. Also, anything that is better with a hybrid gasoline powered car is that much better with diesel. When you take into consideration what it takes to make and store the fuel for CNG, LNG, or even Hydrogen, diesel is far more efficient, and can produce much less pollution than any of the above.